The SimpleOpenExamples procedure opens three files. The first example opens a file named MyInputFile.txt for input. This statement generates a run-time error if the file is not found, so it would be best to use an error-handling mechanism. The second example opens a new file for output, overwriting any existing file with the same name in the same directory without any warning. The third example opens a file in Append mode. If an existing file is present, the existing file is used; otherwise a new file is created. WARNING Openingfiles is an error-prone process. You would be wise to use an error-handling mechanism in any procedure that uses Open. where FilenumberList is a comma-separated list of file numbers to close. If you do not specify any file numbers, Close will close all active files that were opened using Open. Obviously, after you call Close with a file number, the file number no longer ceases to be associated with the file that was closed. Opening and closing files does not do any good unless you can read or write from those files. Depending on what you are doing, you will use Input, Input #, Line Input #, Print #, or Write # to read from or write to a file. The use of these statements is detailed in the following list. Input The Input statement is used to read data from a text file n characters at a time where n is the number of characters to read. Input returns any character it comes across such as commas, tabs, quotation marks, linefeeds, and spaces in addition to normal text. You can use the VBA functions EOF and LOF to determine if you have reached the end of file and to determine the length (size) of the file. Input # The Input # statement is more sophisticated than Input. Input # knows how to read data into a series of variables. It also removes quotes and converts date strings to VBA dates. Use Input # on files created using the Write # statement. 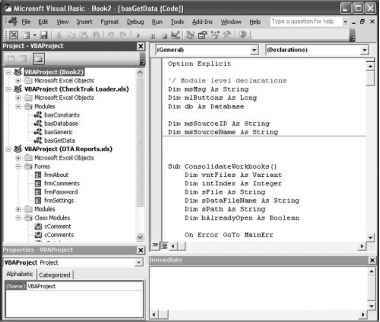 Line Input # The Line Input # statement is meant for reading entire lines of data at once from a text file. Line Input # is usually used against text files written using the Print # statement. Print # Print # is used to write display-formatted data to a text file. Print # is usually used to create files for use with the Input statement. Write # Write # is meant for creating data-oriented text files. Files created using Write # can be easily read using the Input # statement. Listing 15.5 presents an example that uses Write # to create a comma-delimited file based on the worksheet shown in Figure 15.16. After creating a new file, a second procedure opens the file and writes the data from the file onto a new worksheet using Input #. O 11 iMil 1 H (iii.itr if 1 ni -- -. How to use the open statement in VBA?